The combination of buying a kayak for a bit of exercise, and the appalling weather of the summer of 2012 led me to explore the rivers and canals when I couldn’t get out to sea. I discovered a new food supply in the form of Signal Crayfish, the alien species which are taking over our rivers and lakes. They cause considerable damage by eroding banks with their burrows, and eating fish eggs. Worse, they carry a disease which is fatal to our native White Clawed Crayfish, so the more we catch and eat the better. You have to have a licence from the Environment Agency to operate a trap but currently there is no legal restriction on using a crab line or drop net to catch them (although it is worth checking as these things change). Just make sure you know the difference and don’t catch a White Claw by mistake, there are big fines if you do. If you catch one Signal, all the others will be Signals because they don’t mix. Do a check on the web for photos of the differences, but as a quick guide, if the claws have a white spot on the hinge on top and are reddish colour below, and the carapace front (nose) has a jagged point rather than a smooth point, you have a Signal Crayfish. To catch them, simply bait a drop net with fresh fish or raw chicken, leave it in the water 15 minutes, and lift. If you blank, put it straight back, they will be on their way (following the scent trail). After a while you will have one to five crayfish per drop. You will need to allow 15 per serving, or less if you are using them as a garnish or ingredient. It is best to purge them, which means keeping them in fresh clean water for a couple of days so they empty their systems of the stuff they have been eating. To cook them, simply fill a large pan with salted water, add a bunch of herbs or whatever seasoning takes your fancy, and boil for 10 minutes (large) to 6 minutes (small) – I put it that way round because you will have a mixture. Put the big fellas in, then four minutes later but the smaller ones in. That way they finish together. When cooked they will be that lovely red colour instead of the evil greeny black they were when you first met them. Allow to cool, then either eat, or keep very chilled in the fridge for a day or two. Like any shellfish, take great care you don’t allow bacteria to take hold. To prepare, twist off the tail, pull off the covering shell, trim off anything unsightly you don’t fancy eating, and if despite purging there is still a black vein in the tail, slit it like you would a jumbo shrimp and remove the black tube. Posh cookery books call it a vein, actually it is poo. The only other bit worth going for is in the claw and claw arms. These are worth cracking and digging out the meat. Now you will realise why you need 15 per person – there isn’t much to eat, but what there is, is seriously yummy. When you tire of eating simple crayfish salad, try a dip made of 4 tbs mayo, 1 tsp tomato ketchup and a mad dash of tabasco. 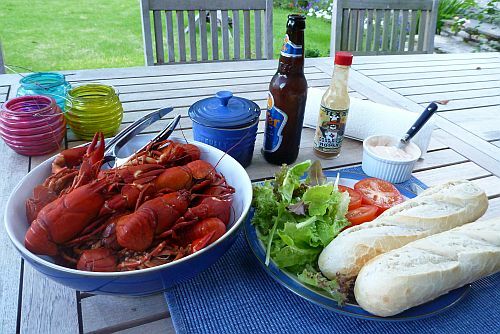 When you tire of that, get adventurous and Google crawfish recipes from Louisiana, where the crayfish (crawfish) is the state animal. There are plenty of crayfish in the rivers, and plenty of recipes. Enjoy. Cook crayfish and remove the meat. Boil 350grams spaghetti according to the pack instructions. Meanwhile heat a tablespoon of oil in a frying pan, and gently fry a crushed clove of garlic and a whole dried chilli in the oil. When golden, add four or five large tomatoes, chopped. Cook gently until they are squishy. Add a few spoons of the spaghetti water to keep it runny. Add the crayfish to the sauce, a couple of tablespoons of chopped parsley and the zest of half a lemon. Squeeze the juice in, adjust seasoning with salt and pepper, remove the chilli and pour the sauce over the pasta. Enjoy.